“Brief update on the population status of bobcats in New Hampshire. Draft bobcat season proposal to be discussed. (K. Gustafson, Game Program Supervisor & P. Tate, Furbearer Biologist).” The bobcat, because of its dwindling population, has been protected from hunting and trapping in NH since 1989. 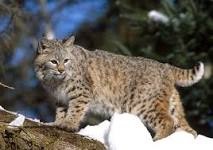 The bobcat is a very elusive creature and avoids people and population areas. Few of us have yet had an opportunity to even see one. In the rare instance when one would be a problem that one individual could be managed. There is absolutely no good reason to randomly hunt and trap bobcats. The only reason would be to sell hunting and trapping licenses to enable hunters and trappers to benefit from the sale of their pelts. Please come out and show your support for the bobcat on January 21. Please attend one or both of these. #1 Plan on attending the Fish & Game Commission meeting that begins at 1:00 pm to show solidarity with the bobcat and keep the moratorium going against any killing of them. If you can fill some seats during the bobcat discussion by the Commissioners, that would be most helpful. Let’s all try to sit together. And if you choose to speak, the public is allowed to make comments during the discussion when recognized by the Chairman. There is also a public comment period at the end of the meeting, providing another opportunity to speak. Your comment can be as simple as saying your name and town and that you oppose the hunting and trapping of bobcats. #2 Prior to the meeting we are having a peaceful, outdoor demonstration holding various “Save the Bobcat” signs while standing near the front door to the Fish and Game building. What: Save the Bobcat actions. When: Wednesday, January 21 beginning at 12:00 pm. The Commission meeting begins at 1:00 pm. The bobcat discussion is item #3 on the agenda so could begin at 1:30 or 2:00 although this is hard to predict. The look on this bobcat’s face is that of a frightened animal watching as his tormentor approaches. Is this how we should treat our bobcats? It will be, unless we fight, and win, for them. if you are unable to attend write or call to express your outrage. You can also write Fish and Game to let them know what you think of them opening a season on bobcats. Director Normandeau: glenn.normandeau@wildlife.nh.gov and address the letter both to Director Normandeau and the Fish & Game Commission (Ted Tichy is the Chairman). Postal address is this: Director Normandeau & Fish & Game Commission, 11 Hazen Drive, Concord, NH 03301. Author, Gus Bennett & Dorinne Whynott, Owner of Professional Pet Sitting Etc. Why would you want to crate a cat? Kind of sounds awful. Putting us in a cage!! Eeeek, don’t do that to me !! Only kidding. I LOVE my crate. Most cats hate their crate. Going to the veterinarian is probably the only time your cat has ever been in a crate. That is scary enough but then being shoved in this small cold box, with all kinds of strange noises from cars and traffic, then strange smells at the vet, just make most cats associate the crate with scary things. Having a cat afraid of the crate is the number one reason that cats do not go to the veterinarian on a regular basis. The cat sees the crate and disappears into thin air never to be found until the time for the appointment has passed (we are pretty smart, like that)!! Or your cat turns into the meanest cat on earth, hissing, clawing and biting. Twisting and Turning like Houdini until you give up. Getting your cat used to being in a crate and actually loving the crate is essential to your cat’s health. Why? Because having your cat love his crate will lower their stress making it easier for you to transport, go to the vet and more. Why is this important? A cat that feels comfortable in their crate, with a lower stress level, will allow your veterinarian to get a better physical. The cat’s heart rate will be lower and they may be easier to handle. 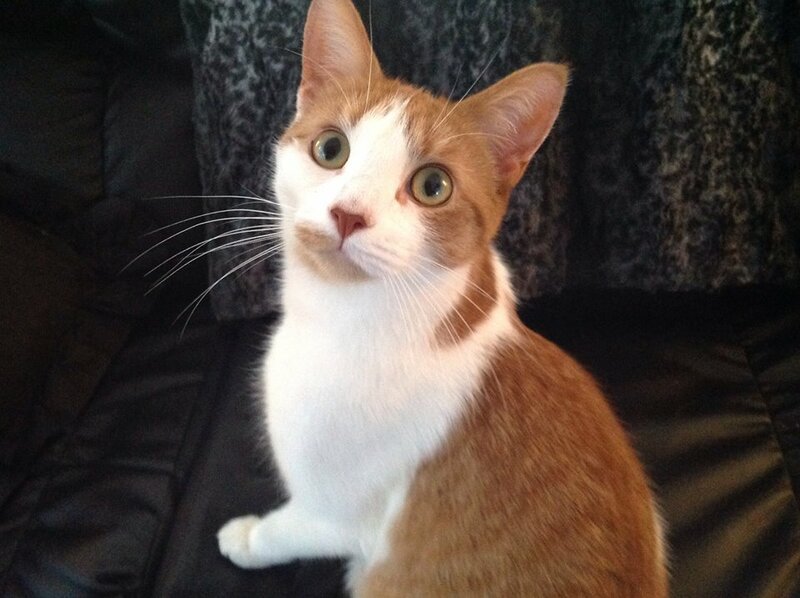 What other reasons can crating your cat be good for? If your cat ever has to go to the hospital and stay for a few days for surgery or testing, having a cat used to being confined will make your cat’s stress level lower and less traumatic. Again, making it easier for your cat and veterinary staff. The bonus is that a less stressed cat heals faster (like people). Plus having your cat enjoy their crate will also lower YOUR stress level getting them into the crate. You can use the crate as a kitty bed (I love sleeping in my crate, if I can steal Linus’ crate to sleep in, even better). Place fluffy towels or blanket inside and leave the door open. Place the crate bed in the living room or bedroom. After a while your cat will seek out the warm and inviting bed. You can place treats in there every now and then to entice them even more. I LOVE TREATS!! Why else is getting your cat used to a crate good for? My Mom does, she feeds us all in crates!! Yup, she has trained us all to get in our own crates at feeding time and we do. She does not allow us to go in any one else’s crate. Every time one of us jumped into the wrong crate, Mom would gently remove us and place us in the right one. It took about two weeks for all of us to understand what my Mom wanted us to do but once we did, it was easy. Now, we all jump into our own crate and wait for dinner (or breakfast)!! Why does she do this? Well, the idea started when she was getting her certification for Disaster Animal Response (read more on Disaster Planning for You and Your Pets). She was thinking that if we need to evacuate for any reason, how was she going to round up 9 cats in a few minutes….….food! So, she started feeding us in crates. What my Mom found was a whole bunch of other reasons to feed us in crates. Feline nutrition still needs more research but with all the research my Mom has done for all of us, she really believes that feeding us a diet of dry food causes many health problems. Just in our house alone, with past and present kitties, when we were on dry food, she has seen kidney issues, obesity, crystals, bladder issues, dehydration, food allergies, lots of vomiting, IBD and more. My Mom used to feed free choice (big bowl of dry food to eat whenever). Wish I was around then!!! Boy, I would have tried to eat the entire thing. Yes, I am a food hound. Once she did switch over to feeding all of us canned food, she was amazed at all the positive changes, and even more positive changes feeding everyone in crates (read more on Feeding by Gus Bennett). During feeding, My Mom lets us hang out in our crates for about an hour. This is because many of us have slowed down our eating so much, that we eat a little, fall asleep, then eat some more. Some of us, like me, just eat everything, then fall asleep. 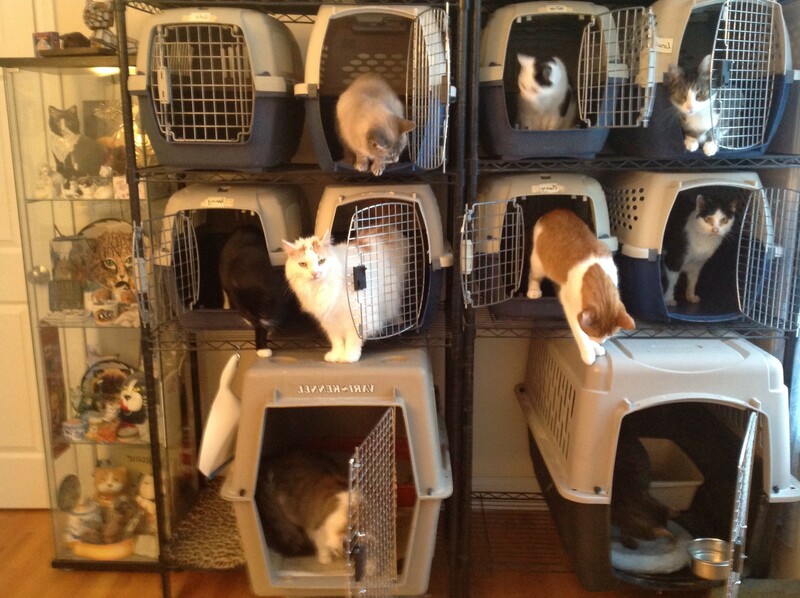 This is how you want your cats to be in crates. A Cat that considers their crate a happy safe place! Priceless !! Pet Care Tips for every month, here is the Month of January. As you flip over to the new year. Put reminders when your pet’s Veterinary Visit is due. Include Annual physical, vaccines and Heartworm check (for dogs). Do not forget to check their teeth. Dental health should be checked annually. Rule to keep in mind – if it is cold out for you, it is cold out for a pet. If they are to be outside for any length of time, Please make sure that they have a full shelter to get out of the cold, rain, snow and wind. They can freeze and get frostbite just as we can. Many Cats, wildlife and other animals may try to keep warm inside a vehicle. Engines are nice and warm right after you come home and park. Sometimes clapping your hands and speaking loudly may scare an animal away. If you can, open your hood and inspect the inside before starting. If your pet will be spending alot of time outside, you may want to increase food. Keeping warm takes added energy. Puddles may contain antifreeze. It is lethal to pets and humans. Animals can be attracted to it because it is sweet. Clean thoroughly if you spill. Check paws daily for chapped and cracked paw pads. Use Bag Balm to keep soft. 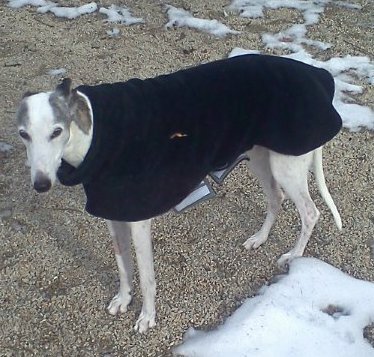 Short coated dogs may get cold very fast. Consider buying a coat or sweater to help. Boots may be hard for them to get used to but may also be a good idea. Wipe paws, feet and legs after each walk. They may pick up deicers, salt, antifreeze or other chemicals while walking. You would want to clean that off before your pet has time to lick off. Unless your know for SURE that the ice is completely solid and 6 or more inches thick with temperatures below freezing consistently for at least 3 or more weeks, do not even chance your life or your pets life. Be Prepared for severe weather, blizzards & power outages. Have a plan in place that includes pets if you must leave your home. Never leave your pets, even if people say you will be back in a little while, too many times, something happens and that little while may be a day or longer. Also have extra food and water for you and your pets. Check out our Disaster Planning for You and Your pets for more Helpful ideas. Help any cats or dogs that may be abandoned in your neighborhood. Many pets are left behind with owners hoping some kind person will take them in. 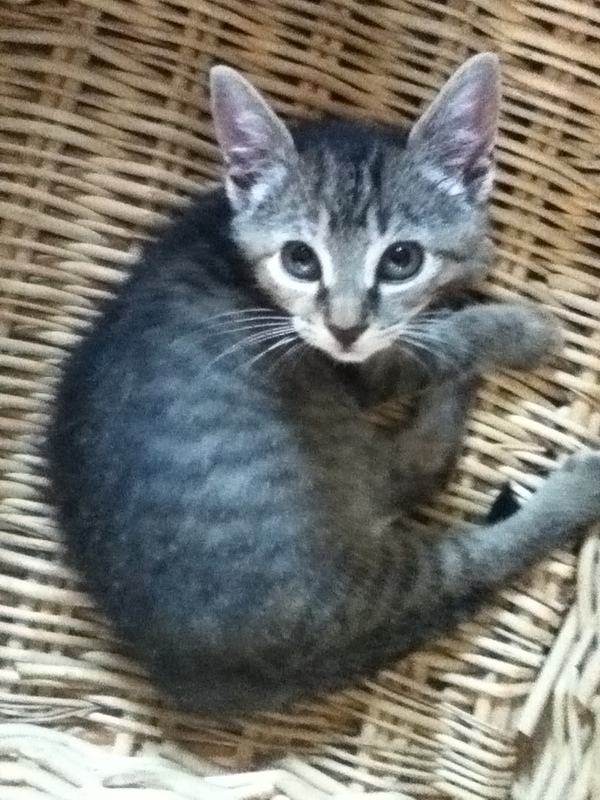 Or that abandoned female cat, has kittens and now there are feral kittens in the neighborhood. If you can contact organizations to help trap them, they can help the animals find homes. If feral, there are organizations that will trap them, make sure they are healthy, spay and neuter them and find barn homes for them or if you will help feed and make them a shelter, they can be returned to live out their life without having more kittens. If you see a pet consistently kept out in the cold, rain, snow. Say something to your local animal control. Document everything you see, dates, times, if you see anyone giving fresh water or food. It could mean life or death to that pet. Horses and other livestock need shelter as well. They need to be able to get out of the cold, rain, snow and wind. To keep warm, they also need extra food. Water needs to be checked often so that it is not frozen. If you have any FEBRUARY dates you will be away, especially for the February School vacation, please make your reservations NOW to ensure availability.